May 16, 2017 May 31, 2017 by Sally Ride Science . Posted in " News Releases " . Tags " GirlsInSTEM, Sally Ride Science, STEAM, STEAM education, STEM, STEM education " . Local girls and their parents had some hands-on fun exploring astronomy, oceanography, robotics and more during an Open House previewing summer workshops from Sally Ride Science at UC San Diego. 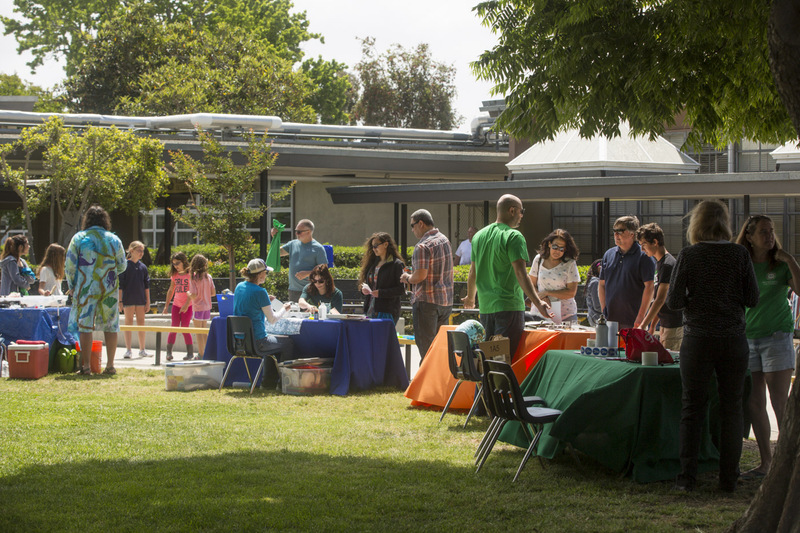 The event May 13 at Mission Bay High School in Pacific Beach offered an advance look at the Sally Ride Science Junior Academy, to be held at the school from June 26 to July 21. The academy, entering its second year, offers weeklong half-day courses that are open to all students entering grades 6 through 12, although the emphasis is on engaging girls in STEAM – science, technology, engineering, art and mathematics. In fact, more than half of the courses offered this summer are new – Art of Anatomy, Ethically Hacking Toys and Science of Science Fiction, among others. Experienced STEAM educators lead the classes. Kilb gave Open House visitors a preview of Music of Earthquakes, a course she will teach during the academy. Girls stopping by her booth had fun tapping their toes on a piano keyboard floor mat. Other previews gave a glimpse of courses such as Pirate Science, Slimy Sea Creatures, Space Out and Introduction to Robotics. Visitors ducked into a large domed tent to learn about Make Your Own Inflatables. And students and parents crowded around the Messy Science demo to watch a simulated glacial flood in a plastic tub. Click here to see a complete course list and to register. Open House guests help create a glacial flood at the “Messy Science” booth. Donna Mills, a teacher at Capri Elementary School in Encinitas, strolled from booth to booth with her husband and two daughters, ages 13 and 15. Mills said she wanted to let her daughters discover which courses interested them most. “I’m hoping to give them a little taste and see if they get excited about something,” she said. During the Junior Academy, each one-week course consists of daily three-hour sessions. For the weeks of June 26, July 10 and July 17, morning sessions run from 9 am to noon and afternoon sessions from 1 to 4 pm. There is also an option to sign up for both morning and afternoon sessions and stay for a supervised lunch period. The week of July 3, only one session will be held, from 9 am to 2 pm, and there will be no class July 4. Classes are $150 each. Sally Ride Science was founded in 2001 by America’s first woman in space, along with four like-minded friends, to inspire young people in science and engineering. Sally Ride Science became part of UC San Diego in 2015. UC San Diego Extension, Scripps Institution of Oceanography, and the San Diego Supercomputer Center oversee programs offered by Sally Ride Science at UC San Diego. The three entities helped to develop the Junior Academy curriculum. Nearly 400 students took part in last summer’s academy.